Beautiful, blonde Anne Gwynne was born December 10, 1918, in San Antonio, TX. Moving with her parents to Missouri, she attended Stevens College. Anne moved to L.A. when her father was transferred and immediately obtained modeling jobs and little theatre work. Universal soon interviewed her and signed her to a contract after only 30 min—with no screen test. Anne’s first serial was “The Green Hornet” (‘39) followed by “Flash Gordon Conquers the Universe” (‘40) Anne remembers, “It was actually made in ‘39. I’d done a couple of leading lady roles with Johnny Mack Brown, and this was my first villainess. (Laughs) The script looked like a telephone book—I was glad I didn’t do that much in the first of it. Actually, I was making ‘Honeymoon Deferred’ with Edmund Lowe at the same time. I’d go from one set to the other—putting that blonde wig on, when I played Lady Sonja—taking it off when I was playing somebody else. I thought it was kind of fun, being a meanie! Don Rowan, who never did much after that—at least not that I know of, was my cohort, and we reported to Charles Middleton, Ming the Merciless! What a great actor he was…we always called him Ming, not Charles or Mr. Middleton. Matter of fact, when I see him in an old movie, I still think of him as Ming—even if that movie is ‘Gone With the Wind’. “Get away from that door, Gordon, or I’ll pull the trigger,” demands Capt. 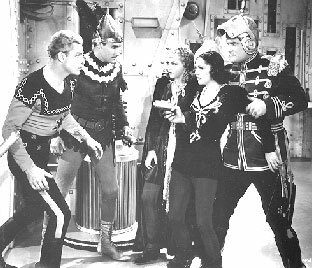 Torch (Don Rowan) as he and Lady Sonja (Anne Gwynne) hold Dale Arden (Carol Hughes) and threaten Flash Gordon (Buster Crabbe) and Roka (Lee Powell) in Chap. 10 of Universal’s “Flash Gordon Conquers the Universe”. There was a little trouble with the production at first. They wanted Jean Rogers to play Dale Arden—she had done it in two earlier ones. But, she’d left Universal and was under contract to Fox, and Fox said ‘No.’ (Laughs) They had plans for her, and around that time she played with Tyrone Power in ‘Brigham Young’ as one of the wives! So, they wound up with Carol Hughes, who was a lovely girl and who I thought resembled the cartoon Dale. They must have thought so, too. They brought in a new Prince Barin, Roland Drew, who was handsome in the Errol Flynn way. He was a good actor—but he never made it big like he should have. They changed this one where Mongo looked more like Sherwood Forest—maybe that’s why Roland replaced the other Prince Barin—who resembled Friar Tuck more than a prince! (Laughs). There were quite a lot of good looking young men in the serial. I know Donald Curtis, who soon went to MGM, was one of them—but he was an ally of Flash, so I only appeared in fight scenes with him. In one scene, Don and I are captured by ‘rock people’. I thought the special effects on those sequences was very well done— where they mix together and form a rock—then separate again. Their speech was supposed to be a foreign tongue—actually, the special effects people recorded them speaking—then played it backwards on the film to get that effect. I thought Anne looked very beautiful in tights and mini skirt! In fact, it was this very serial that got me hooked on old movies. I watched old movies to see more of Anne Gwynne and became hooked on them all! It was “Flash Gordon Conquers the Universe” that did it for me! Anne plans to attend the October 2-3 Hollywood Collectors Show at the Beverly Garland Holiday Inn in North Hollywood. Recently, I chanced to overhear my neighbor telling his twelve year-old son who Zorro was. He was about to take the boy to see the new, big screen version “Mask of Zorro” starring Antonio Banderas and was in the process of explaining the origin of the masked man to his untutored offspring. Problem was, everything he was telling the kid was dead wrong, specifically that Zorro was an ancient Spanish legend, something akin to England’s Robin Hood or America’s Paul Bunyan. 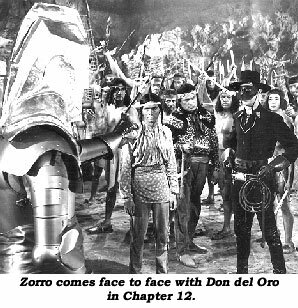 Later, over a tall one—having not wished to embarrass him earlier in front of the boy—I casually asked him if he knew Zorro was in reality a product of the 20th century, a creation of an American pulp writer named Johnston McCulley back in the ‘20’s. He didn’t seem to appreciate hearing this, and I decided to leave it at that. After all, he was buying. In truth, he really wasn’t so off the mark because Zorro, much like other fictional creations, from Sherlock Holmes to Superman and Tarzan, long ago entered that special arena of the imagination reserved for those unique characters who have grown beyond their printed origins. Not only has this select group taken on a much expanded life of their own via popular culture (whether it be comics, radio, film, TV) but actually come, in the public mind, to be the stuff of legend, much as my friend had been saying. A good deal of the Zorro saga, however altered, changed, mutated, updated and re-arranged, is owed to Republic. The swashbuckling masked character, first introduced to film goers by Douglas Fairbanks in 1920’s “Mark of Zorro”, was a film natural and it didn’t take Republic, the home of the action feature and serial, long to realize the character’s great cinematic potential. This column is too short to give a complete history of Zorro, so I’ll instead recommend a fine recent work titled ZORRO UNMASKED by Sandra Curtis (Hyperion Press). It’s the definitive book on the subject. After Republic’s first experiment with the character in the feature, “The Bold Caballero” starring Robert Livingston (‘36), they opted to update him for his first serial appearance in “Zorro Rides Again” (‘37) with John Carroll as James Vega. This was an exciting chapterplay, long on action (thanks to Yakima Canutt) and thrills. To many, however, their next Zorro serial, filmed two years later in ‘39, was their best, “Zorro’s Fighting Legion” starring Reed Hadley. As a kid, watching serials on early television, this was the film that provided my introduction to the character. Needless to say, I was completely hooked from the instant I saw him in that black outfit and mask, expertly wielding both a sword and whip (and occasional pistol). It became the definitive way I perceived Zorro and, although I enjoyed later incarnations of the character as created by Tyrone Power and Guy Williams, I never could entirely put the Hadley interpretation or this terrific serial out of my mind. “Zorro’s Fighting Legion”, however, deviates considerably from the story lines of most Zorro films which tend to present and re-present his origins.Set in 1823, the screenplay places Zorro (Hadley) in the center of a political fracas wherein Benito Juarez (Carlton Young), first President of the newly formed Republic of Mexico, attempts to secure the financial stability of his country by forwarding rich ore shipments from the Mendolito mines. Corrupt officials try their best to thwart this scheme and one, taking on the masked identity of a god called Don del Oro, enlists the aid of the local Yaqui Indians to help disturb the gold shipments. Zorro, in the person of the foppish Don Diego, arrives and leads a legion of patriotic masked night riders in an attempt to protect Juarez’s scheme and bring the conspirators to justice. It takes him 15 grueling, exciting, death defying chapters, but in the end, he does just that. 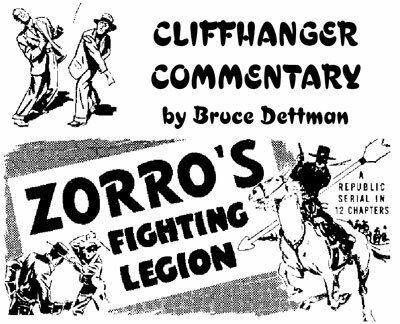 As directed by William Witney and John English, “Zorro’s Fighting Legion” is a serial fan’s dream. Again, thanks to Yakima Canutt, the action sequences are superbly choreographed and the cliffhangers some of the best offered during Republic’s so-called Golden Age. What makes this particularly impressive is that western serials are more limited than their modern day counterparts, where scientific gadgetry and futuristic weaponry can often be utilized for unique chapter endings. Reed Hadley brings class, stature and good acting skills to the dual role of Diego and Zorro. Hadley, whose commanding voice would later be used on Mutual from ‘42-’44 in the “Red Ryder” radio serial and by such studios as 20th Century Fox to narrate their war and documentary crime films and, who at the end of his career, wound up starring in such TV shows as “Racket Squad”, keeps the foppish nature of Don Diego in check yet still seems to be having fun with the part. It’s obviously Canutt in most of the action scenes, but Hadley has a good physique for the part and moves well when glimpsed as the masked man. However, the costumes, particularly the hats of his Fighting Legion, have always appeared a bit silly to me. I think it has something to do with them looking too much like the lampshades from the house in which I grew up. I also prefer Zorro, who I always think of as a night rider, on a black horse—but these are small complaints in an otherwise memorable, thrilling cliffhanger. As far as the bad guys go, this serial is a veritable cornucopia of celluloid mayhem. Unlike later Republic cliffhangers where the secondary villains who popped up—often in different roles from one chapter to another—were made up of stuntmen like Tom Steele, Dale Van Sickel and the like, “Zorro’s Fighting Legion” is full of wonderfully familiar players who made their livelihoods from 1930 B westerns, people like Edmund Cobb, John Merton and Charles King. Even one of screendom’s silent Tarzans (who also played the Ape Man on radio) James Pierce, is on hand as are journeymen actors C. Montague Shaw, William Corson and Joe Molina. With little fear of contradiction, I rate “Zorro’s Fighting Legion” as one of Republic’s best efforts and one of Zorro’s most memorable screen appearances. In “Zorro’s Fighting Legion” Ch. 4, Reed Hadley as Zorro (and his stunt double) ride two slightly different horses in close up and long shots.